Let’s face it, Orlando (aka Disney World) gets HOT. Not just some Arizona or Las Vegas heat. I’m talking about take one step outside and your back is soaked kind of hot. So that’s why it’s super important to stay hydrated and stay cool in Disney World. But hey, this doesn’t mean you have to find every air condition ride or building in Disney, because there are better, more tastier ways. 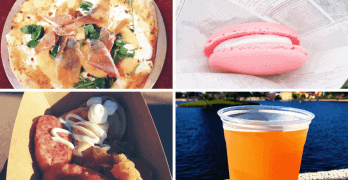 Here are the 10 very best ice cold snacks that will help keep you cool and comfortable during your visit to Walt Disney World. Walking around the world can be exhausting. That’s why it’s important to cool off with a vanilla cone. Get it from the France Pavilion in Epcot, Anandapur Truck in Animal Kingdom, Auntie Gravity’s Galactic Goodies in Magic Kingdom, or Gertie’s Ice Cream of Extinction in Hollywood Studios. Drink like Gaston. Apple freeze with marshmallow syrup topped with passionfruit foam. Get it from Gaston’s Tavern in Magic Kingdom. Literally for the price, this is a bargain because it’s huge AND under $5. Get this Japanese take on shaved ice by topping it with the milk sauce (tastes like condensed milk). Get it from the Japan pavilion in Epcot. Cool down with this berry slush then dominate on Toy Story Midway Mania. Get it from Hey Howdy Hey Takeaway Wagon in Hollywood Studios. At Minn and Bill’s in Hollywood Studios, you can experience seasonal milkshakes all year round. My personal favorite was the cinnamon churro milkshake. This is a unique tasting smoothie that grows on you. If only it were as good as bubble tea. Get it from China Tea in the China Pavilion in Epcot. Gelato and fresh baked chocolate chip cookie. What more in life can you ask for? Get it from Gelati at the Italy Pavilion in Epcot. Your choice of ice cream topped with all the fixings, all in a freshly made waffle bowl. Get it from the Plaza Ice Cream Parlor in Magic Kingdom. It’s both a drink and an ice cold pineapple snack. By far the best way to cool off in my opinion. Get it from Aloha Isle in Magic Kingdom or Pineapple Lanai at the Polynesian Resort. Thanks for reading and hopefully you find a delicious salty Disney World snack that you can treat yourself to!